RunBot, a biomechatronic pair of legs that can walk at 3.5 leg-lengths per second, has now achieved human walking speed. RunBot is different from those other biped bots, who walk like your great-grandfather. RunBot's mechanical structure is directly driven by motor-neurons of its neuronal controller, which is analogous to what happens in human and animals' walking. It is 23 cm tall, foot to hip joint axis. Each leg consists of two degrees of freedom: hip and knee joints. Each hip joint is driven by a modified RC servo motor producing a torque up to 5.5 kg.cm while the motor of each knee joint produces a smaller torque (3 kg.cm) but has fast rotating speed with 21 rad/s. The built-in servo control circuits of the motors are disconnected while the built-in potentiometer is used to measure the joint angles. A mechanical stopper is implemented on each knee joint to prevent it from going into hyperextention similar to human kneecaps. Runbot has no actuated ankle joints resulting in very light feet and being efficient for fast walking. Its feet were designed having a circular form 4.5 cm long similar to passive biped robots. Each foot is equipped with a switch sensor to detect ground contact. This mechanical design of Runbot has some special features, e.g. 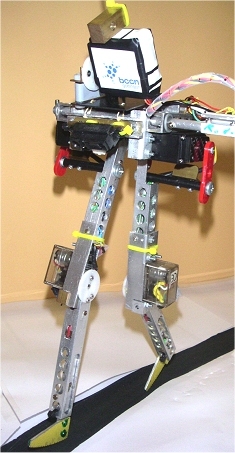 small curved feet and a properly positioned center of mass that allow the robot to perform natural dynamic walking during some stage of its gait cycles. In addition, the active upper body component is implemented on the top of its hip joints for balance in walking on different terrains, e.g. up and down slopes. When RunBot encounters a slope, the higher level functions of the robot are used. Professor Woergoetter, of the University of Gottingen, in Germany, said: "When Runbot first encounters a slope these low level control circuits 'believe' they can continue to walk up the slope without having to change anything. "But this is misguided and as a consequence the machine falls backwards. This triggers the other sensors and the highest loop we have built into Runbot - the learning circuitry - and from that experience of falling the machine knows that something needs to be changed." Professor Woergoetter's goal with RunBot is simple: walk like a person, and not like a clunky movie robot. And it really works; check out the video of RunBot shown below. Via LiveScience; see also the RunBot Fast Dynamic Walking Robot website. Thanks also to Zac for suggesting this story.